FRONT: Kevin Smith, Jacob Holder, Ryder McCormick, Sully Green, Maddox Mills. BACK: Scott McCormick (Coach), Levi Bullock, Ethan Delyea, Nefin Barlow, Cohen Mason, Blake Charette, Bret Mason (Coach). Absent: Jagger Cruikshank, Heath Davidson, Theo Favreau, Jude Hughes, Diesel Podrasky. Front: Cole Bailey, Henry Clarke, Linkoln Philpotts. MIDDLE: Korbin Friesen, Hunter McCormick, Levi Ingram, Dryden Hanson, Noah Glickman, Brennen Peterson, Keanan Lynch. BACK: Devon Hanson (Coach), Scott McCormick (Coach), Zakk Temrick, Cruz Armstrong, Keaton Johnson. Absent: Ryan Armstrong, Patrick Whittington, Nick Larsen. FRONT: Ayden Zimmerman, Oakley Nelson, Wyatt Mason, Nolan Zmurchyk, Lars Cruikshank. MIDDLE: Taylor Ashmore, Caitie McKeown, Wyatt Thurmeier, Jordan Bryant, Rayne Jones. BACK: Justin Zimmerman, Steven Thurmeier, Jay Jones (Coaches). ABSENT: Adelle Green, Bella Ferrarelli, Jorja Dion. Front: Logan Zimmerman. MIDDLE: Ethan Mackenzie, Delano Guzzi, Tyson Gale. BACK: Justin Zimmerman (Head Coach), Nolan Mertz, James Davidson, Oskar Schafer, Dallen Cardozo, Doug Davidson (Assistant Coach). Absent: Adele Stahl, Arthur Dubief, Braxton Hertz, Grady Green, Maggie Sutherland, Rylee Bernemann, Jon Gale (Goalie Coach). Front: Cruz Hess, Blake Bannatyne, Cohen Hide, Harley Magliocco, Andrew Whittington, Jaxson Miller, Dane DeMarchi. BACK: Ben Johnson, Junah Djonlich, Rhys Williams, Sam Arling, Austin Marasco, Ben Novecosky, Sawyer Samycia, Jackson Hobbs. Absent: Felix-Craig Dumba, Mike DeMarchi (Head Coach), Kevin Marasco, Trevor Dumba, Dennis Djonlich, Richard Whittington, Jeff Johnson (Assistant Coaches). Front: Finn Hofer, Ty Marasco, Charlie Guinn, Thomas Cayenne, Bryce Ellerby, Nolan Magliocco, Kelly Bannantyne, Josh Klassen. BACK: Ian Larsen (Coach), Callum Stewart, Mattias Larsen, Blake Goldade, Austin Dixon, Owen Mertz, Jaden Grivell, Matthew Dies, Kevin Marasco (Coach), Rick Magliocco (Coach). Absent: Josh Kallies, Ethan Kallies, Gavin Whittington, Ollie Hafke. FRONT: Brooklyn Freiheit, Dawson Voysey, Jax Ducharme, Tripp Tomlinson, Isabelle Archambault, Jase Hamborg, Zachary Johnson, Nash Lefreniere, Dylan Degrazio, Quinton Pidwerbeski. BACK: Emmy Anderson (Helper), Amanda Lavoie (Coach). ABSENT: Dylan Krushnell, Boston Regular. Front: Gavin Doey, Lucas Johnson, Nathan Hucik, Jayce Bishop, Lexi Cunliffe, Carter Stolarchuk, Landon Gagne, Charlie Stolarchuk, Elsie Archambault, Noah Bilski, Bryan Gorman. Middle: Levi Schindel, Sullivan Psiechnyk, Lilah Bowen, Brody Maston, Colby Ayrheart, Kane Corkle, Liam Cytko, Hayden Bristow. Back: Cayle Pasiechnyk (Assistant Coach), Christina Bilski (Manager), Jeff Cytko (Coach), Karen Sheets (Safety), Travis Corkle (Assistant Coach). Absent: Tim Schindel (Assistant Coach). Front: Wylder Bauer, Gregory Skelton, Jake Trischuk, Kasper Wilm, Nolan Anderson, Quinn Bourgeois, Mason Petovello. Back: Thomas Skelton (Coach), Brad Trischuk (Coach), Travis Bauer (Coach), Lee Wilm (Coach). Absent: Savanna Langille, Casey Mcintyre, Ronan Nahirniak. Front: Sawyer Shaw, Hunter Robar, Ryan Quast, Kesler Traverse, Bryar Anderson, Harrison VanRyswyk. Middle: Robbie Chamberlain, Alexander Wells, Shane Fitzgerald, Ty Cunningham, Cooper Bauer. Back: Jasen Shaw (Assistant Coach), Rebecca Bauer (Manager), Travis Bauer (Coach). Absent: Casey McIntyre, Dan Anderson (Assistant Coach). 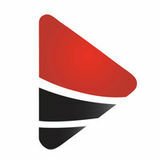 Isosceles is very proud of everyone involved in minor hockey for keeping hockey going under the difficult circumstances they have endured this year. Front: Travis Tougas, Rhys Vinet, Kingston Perry, Alexandria Brickner, Dane Rybachuk, Jelani Clarke, Wyatt Bilski, Jaella Bishop, Rylan Bristow. Middle: Chase Lainey, Callan Oler, Avery Corkle, Jack Simard, Kirin Cunliffe, Aidan Kennedy, Nate Gowan. Back: Dawn Weatherbee (Safety), Jessica Simard (Assistant Coach), Sam Oler (Assistant Coach), Brent Rybachuk (Coach), Tiffany Rybachuk (Manager), Matt Simard (Assistant Coach). Absent: Lyle Bilski (Assistant Coach). Front: Aiden Smyth, Kayden Brunet, Noah Shaw, Zachary Auger, Coraline Cherney, Ava Van Ryswyk, Lucien Genaille, Mitchell Anderson. Back: Dustin Auger (Coach), Blair Bennett, Logan Langille, Brianna Wells, Beau Rector-Hunink, Aaron Schaufele, Cody Wilm, Sawyer Clarkson, Lee Wilm (Assistant Coach). Absent: Kayden Buchner, Dan Anderson (Assistant Coach), Nicholle Auger (Manager). ® Registered trademarks of The Bank of Nova Scotia. NHL and the NHL Shield are registered trademarks of the National Hockey League. © NHL 2015. All Rights Reserved. TM Trademark of The Bank of Nova Scotia. Front: Seth Cherney, Brock Bernhart, Tye Vinet, Owen Hartery, Ethan Doey, Jake Hartery, Jesse Tennant, Eric Kabel. Middle: Jaxson Etele, Ryker Bauer, Colby Dobson, Lucas Ayreheart, Kayden Boyd, Wyatt Wilm. Back: Jennifer Cherney (Manager), Mike Etele (Assistant Coach), Bruce Doey (Assistant Coach), Lee Wilm (Coach). Absent: Chris Cherney (Assistant Coach), Darcy Bernhart (Assistant Coach). Front: Brennan Koch, Mason Benoit, Kaelen Vinet, Neven Etele, Emmy Anderson, Brooke Hartery, Finlay Tobin, Connor Dudka, Lincoln Cromey. Middle: Amanda Lavoie (Assistant Coach), Brayden Baher, Carter Paulsen, Kiedis Ostoforoff, Bobby Beranek, Gavin Sammartino, Brock Smith, Austin Roberts, Carson Tennant, Taylor Smuin. Back: Jamie Sammartino (Assistant Coach), Troy Tobin (Assistant Coach), Ewen Koch (Assistant Coach), Mike Etele (Coach), Sheldon Tennant (Safety). Absent: Crystal Hartery (Manager). 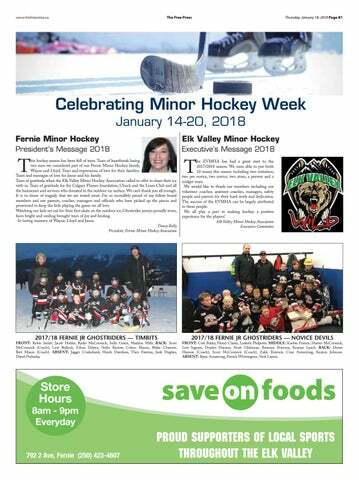 Celebrating Minor Hockey Week January 14-20, 2018 Congratulations to the players and parents for their committment to the game. Front: Blaine Trischuk, Braiden Bishop, Ty Gauthier, Adam Latka, Aaron Halladay-Dmytriw, Cole Tennant, Lindi Clarkson, Gavin Gainz, Bryce Garrett. Middle: Kacie Corkle, Emalie Smith, Brayden Holberton, Erik Haugo, Jayden Logodi, Soren Nicol, Owen Rybachuk. Back: Crystal Tennant (Manager), Adam Gauthier (Assistant Coach), Travis Corkle (Coach), Brent Rybachuk (Assistant Coach). Absent: Dallas Smith (Assistant Coach), Scott Latka (Assistant Coach), Adele Borys (Safety). Front: Dylan Baker, Dawson Hutchinson, Benjamin Durban, Alysha Vanbibber, Bowen Arola, Mackenzie Spence, Dylan Delorme, Gabriel Dobson. Back: Jen Stevens (Assistant Coach), Brady Clowe, Jakob Brickner, Justin Scarpelli, Austin Norgate, Logan Legault, Justis Ruta, Jason Dobson (Coach). We salute all the Minor Hockey players, coaches, volunteers & parents who Giv’er! !